Happy Friday everyone! The weather is rainy and dreary here in Florida, so I'm glad I don't have too much on my schedule for today. 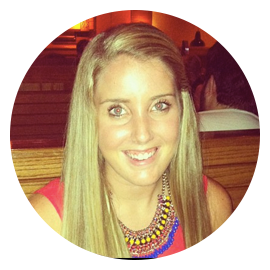 Here's some of my favorite things from the week! - Victoria Justice in Prabal Gurung for Target long sleeve tee for an Extra interview. - Khloe Kardashian in electric blue leather pants at the McDonald's Premium McWrap Launch Party. - Real Housewife of Beverly Hills' Brandi Glanville wore this low-cut lace dress at the Bravo Upfronts Party last night. I would have really loved this if it was just a bit more conservative on the top. Beyonce posted this photo on her instagram and it's rumored to be a sketch of one of her costumes for her upcoming tour. I think it's amazing, and let's be honest, anything that Beyonce wears has to be fierce. Zac Posen designed this stunning gold dress for none other than...Magnum Gold ice cream? That's right, this $1.5 million sequin gown was made for the launch of Magnum's new ice cream. 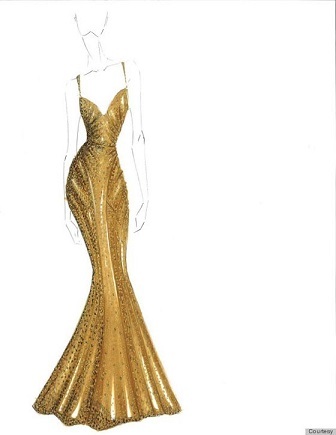 "Creating my first-ever 24 carat gold dress was truly a priceless experience," said Posen. This past Sunday was Easter and I spent most of my day making these fun and festive desserts! I got all three of the ideas from Pinterest of course. 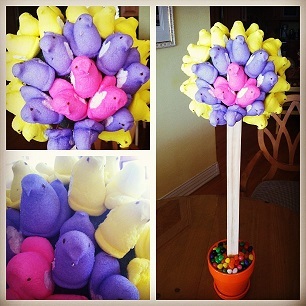 The first is a Peeps bouquet. It wasn't too hard to make, you just need a few Styrofoam balls, a flower pot, toothpicks, and of course, Peeps! I'm not even a Peeps fan myself, but I made it for my family. 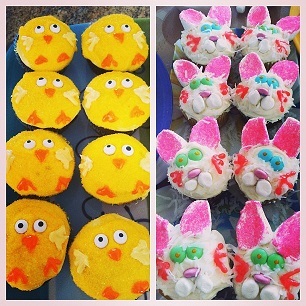 Next are decadent cupcakes in the form of chicks and bunnies! And finally, today is the official launch of Derek Lam's collection for Kohl's! Click here to check out my previous post about his new collection! Oh that Zac Posen dress! love to see the photos!